For his sophomore film Heath Davis takes a hilariously caustic look at our education system and some of the characters behind it. 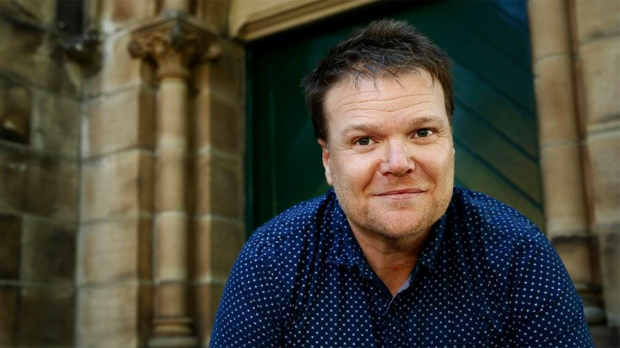 Inspired by his own time teaching high school English, Book Week is the story of failed novelist Nicholas Cutler (Alan Dukes) struggling to make it through one more week of teaching in the hope to get his next novel published. With this Australian comedy hitting screens, DAVID O’CONNELL spoke to Heath Davis about Book Week and the teachers that inspired it. When you were interviewed for Broke, you mentioned that old adage “write what you know”. Is Book Week what you know? Is it really such a smart phone obsessed culture now? It really is, to the point in which the way we teach is a bit prehistoric, we’ve got to engage visually and online. I couldn’t even get them to write down notes, they’d take a picture of the board with their phones. Then you’d get these passionate, intelligent, older, empathetic teachers, often with larger dreams but couldn’t economically chart out a career. They’d teach because it was closer to what they know, but it was incredibly frustrating. Yeah. They are incredibly undervalued and underpaid. And ridiculed! It is a profession that is not treated professionally. And the admin that comes with it as well! It has become more like a business model. Schools aren’t a business they’re about connection. You’re connecting sharing wisdom, especially English. You are sharing some amazing texts and promoting discussions. The meaning of life is often found in those discussions… but you won’t find it unless you give it a go. That’s the artistic side of him. Definitely a combination of some of the older teachers I’ve worked with. That scalawag behavior they may have got away within the 80s and 90s, but now doesn’t fly. They’re flawed, they’re human, and this is a film that shows that. Because when you’re a student you never really thought of your teachers as real humans. What’s it about that “redemption arc” that fascinates you as a writer and director? It gives you somewhere to go with character, you have an arc. It’s the fundamentals of storytelling, if your character doesn’t change along the way then you don’t really have anything happening. For a film on a low budget…that’s all you have. You are reliant on story. They’re also more engaging…I’ve never met the perfect person. Alan Dukes does a phenomenal job, but he’s certainly not the obvious casting choice for a lead, from a Hollywood perspective. Why choose him to be your Cutler? All the artists I know don’t look like Bradley Cooper. The authors, and musicians and filmmakers I know don’t worry about how they look, they worry about what is coming out of them. I needed that guy. Cutler’s an archetypal older English teacher. Walk into any school and you’ll see someone that looks like him. How did you find filming a comedy, after making a drama? Broke‘s got a lot of comedy in It. I see the humour in drama, and the drama in comedy. We never played up the gags, the humour comes from the observer seeing the events. Was it difficult choosing the writer’s quotes you use for section breaks? (laughs) No. Those quotes exist from a writer’s quotes calendar I got as a gift. They’re bumper sticker quotes, and I thought maybe we can play upon this in an ironical way. These famous writer’s vox pops juxtaposing the reality our character is going through. We never make these sort of films, They’re normally Woody Allen like comedies set in upstate New York. Their biggest problem is they’re having writer’s block in their mansion in the Hamptons. Yeah. In Australia, that’s not reality. I’ve got friends that are writers and they really struggle.